A sleeping sickness befalls the little college town of Santa Lora, CA, starting with Mei’s roommate Kara, prompting a quarantine of their dorm. Quickly overwhelmed, the hospital sets up the children who succumb in the public library. The patients wake up in random order with time span and chronology confusion, or they never wake up—dying or coming to consciousness days, weeks, months after succumbing. Mei becomes part of the relief effort by those immune to the illness. 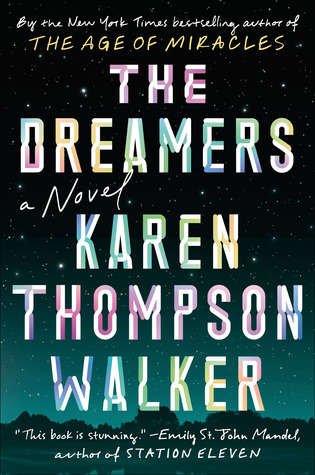 Thompson Walker brilliantly moves in and out of the epidemic containment through cordon sanitaire and the sleepers’ astonishingly realistic dreams. Graphic descriptions of virtual long lives lived for decades and anomalies that persist after awakening draw the reader into the deep wells of grief and confusion of those who wake to a lesser reality. The frustrated anger and desperation of family and friends prevented from contacting loved ones is credibly shown by such irrational actions as climbing the quarantine fence and rushing the police. The author references other such unusual occurrences, and how conspiracy theories can easily form from a frightening epidemic never diagnosed by doctors. It brings to mind the sleepy sickness brought on by the Spanish flu epidemic of the early 20th century, whose victims remained catatonic for decades. I was fortunate to receive a copy of this well-written, wonderfully told novel from the publisher Random House through a Goodreads giveaway.